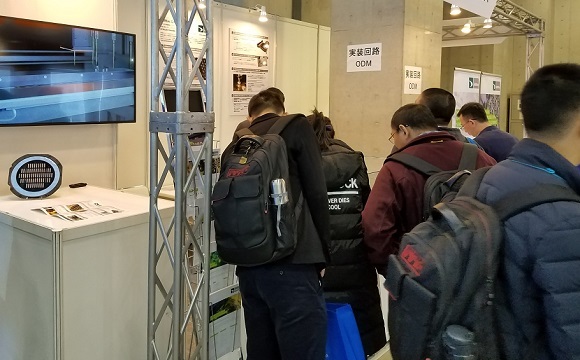 Our client AEMtec joined NEPCON Japan 2019 on January 16th-18th, which was held at Tokyo Big Sight. Nepcon Japan is one of the largest electronic devices special exhibition in Asia related to electronics development and implementation. Design and production engineers come from all over the world, and 2,640 leading companies will exhibit. AEMtec is a German ODM maker that mounts chips and parts directly on board (Chip on Board). On that day, Mr. Cruz lars came to Japan from headquarter office as explainer staff and operated the booth for 3 days with our company’s staff, Mr. Otani and Mr. Kiuchi. At the booth, we displayed various high density packaging samples and about 30 peoples visited in total. We have got two business talks.